Last week, we kicked off our blog series on warehouse technology exploring robotics and how they can improve your warehouse operations. This week, we’ll be diving into a more specific aspect of robotic technology. Drones – robots that can fly! Whether you know them as drones or Unmanned Aerial Vehicles (UAVs), the idea is that these aircrafts can safely perform and accelerate inventory operations in warehouses. They do so with an operator controlling them, or they can work autonomously with a navigation software that is built-in or WiFi-enabled. They also have sensors that ensure anti-collision and safety. If obstacles are detected or the WiFi connection breaks, these drones will automatically stop flying. 1. The drone is tasked with counting the inventory amount of Item A, which is contained in boxes that are stored on the top shelves of an aisle. 2. 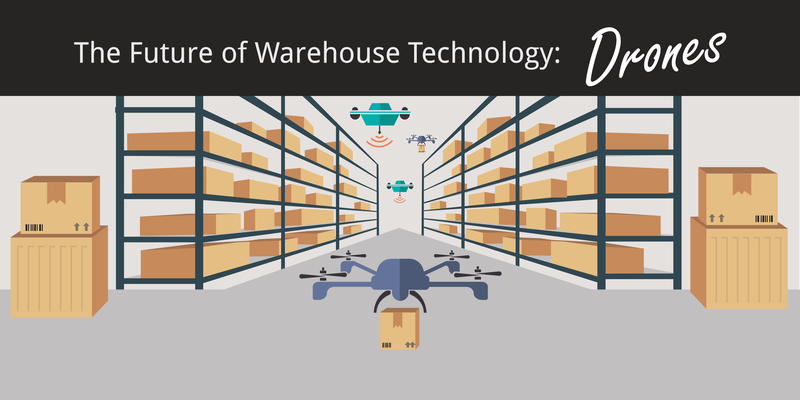 The Warehouse Management System (WMS) is fully integrated with the drone’s software. From this, the drone can access inventory location data down to the specific aisle, rack, or bin level. 3. The drone maps out the optimal travel path to the stock location. The drone has an optical system that combines with computer vision and deep learning technology – which is a sub-field of machine learning that allows it to recognize images based on a network of learning layers. 4. The drone arrives at the stock location, which it knows based on X, Y, Z coordinates. 5. The drone visually inspects the labels, takes a photo of the bar-code, or uses RFID sensors to relay the inventory count to the central WMS. Here we can see how efficiently the drone works. It saves the human worker from having to locate the stock, walk the distance to the aisle, climb up a platform, and manually scan all the boxes to perform a simple count. In fact, drone scanning can be performed 50 times faster than manual capturing. The drone’s photos upload to the system instantly. But in the case of tagging error or discovery of inventory shortage, the drone generates a report that the operator can review and act on. Drones in outdoor yard management or last-mile delivery are not yet widely accepted due to airspace regulations and concerns for public safety. Some operations may also require a certified pilot to oversee the drone. As with robotics and other automated systems, their current degree of performance can only point out the problem after it has happened or as it is happening. Even though drones collect data quickly and accurately, it is up to the human worker to translate their work. You will notice that a recurring theme in this blog series is the idea of human and machine co-operation. In the supply chain, drones are easing the work load of warehouse workers and making operations more efficient. As innovation and investments pour in to drone technology, new advancements get brought into the market every month. While they only have a major role in inventory counting right now, they could become the human worker’s personal assistant in the future. Imagine a generation of drones that can be dispatched to handle e-commerce claims and returns. In fact, Amazon is conceptualizing a drone-based delivery system called Amazon Prime Air as we speak. Drones have proven to be valuable assets in large distribution centers and warehouses. With their RFID scanning abilities and connection to a cloud-based IMS, these flying robots can greatly improve your inventory practices.